Matt Bird Investment Blog: Happy New Year - 2016! Happy new year everyone. Time for my annual portfolio review. It's been another difficult year on the investment front, with virtually all asset classes posting either lacklustre or negative real returns. According to CNBC, 2015 was 'the hardest year to make money in 78 years' (click here to see article). Warren Buffett's Berkshire Hathaway (a holding I own) lost over 11%. His worst year since 2008. While I think CNBC are being a tad over-dramatic (I found 2008 a lot harder! ), things certainly haven't been easy. The FTSE All share (My benchmark index as 88.37% of my holdings fall within it) has dropped -2.2% over the year. Adjusted for dividends of approx 3.8% the total return has been a measly 1.6% *Figures from year starting Jan 3rd 2015. Over the same period my holdings have posted a total return (including dividends less all fees) of 5.3% which marks a 7th consecutive year of index out-performance. Over the last 5 years my cumulative total return has been 64%, not far off double the returns of the All Share at around 36%. I'm quite pleased with my results but a growing bugbear is that a few of the fund managers I follow have performed even better, with total returns in excess of 100% over the same period in some cases. This begs the question: do I hand my money over to them to manage, or do I carry on with DIY investing? I think ultimately I'll do a bit of both. As always there have been significant winners and losers within the portfolio. The three best holdings have been: Google (Alphabet) which is up +45% over the year, Imperial Tobacco up +29.4% & BT up +21%. The three worst losers have been Murray International Trust -15.21%, Templeton Emerging Markets -23.96% and BHP Billiton which I bought into in the summer and gradually sold out again after further research, total loss on that holding was about -25%. Mining/resource companies and emerging markets have had a hammering this year hence the poor performance of Murray International, Templeton Emerging Markets and BHP Billiton as noted above. Commodity prices have fallen to their lowest levels for years, and huge depreciations in emerging market currencies against the dollar have been a big detractor for emerging market based investments. Interestingly I have been reading a book by Jim Rogers called Hot Commodities (my dad's signed copy no less.) The book was written in 2004 and in it Jim touts commodities as a good bet for around a decade. His reasoning was based on the phenomenon of super cycles in commodity markets caused by long term dynamics in demand/supply cycles. He also notes in the book that during commodity boom cycles, equities tend to perform poorly, and during commodity bust cycles equities tend to perform well - which does make sense as lower commodity prices mean lower business costs and more money in the pockets of consumers. Jim does have quite a good track record for being right about things. He co-founded the Quantum hedge fund with George Soros, which managed to deliver returns of around 4200% in its first 10 years. Not only was Jim pretty accurate with his call on commodities, he was also somewhat prophetic in noting that the financial system in the USA was up the spout, and he expressed specific concerns over US mortgage financiers Freddie Mac & Fanny Mae. It's unfortunate that people like him aren't more actively involved in government. 12 years have passed since Jim wrote that book, and perhaps we are now seeing the end of the commodity super cycle he described, and the start of a commodity crunch. If so, and commodity prices are set to be weak for a prolonged period, this could provide a strong tail wind for equity returns. The graph below (from Fidelity) attempts to highlight bull and bear markets in equites. 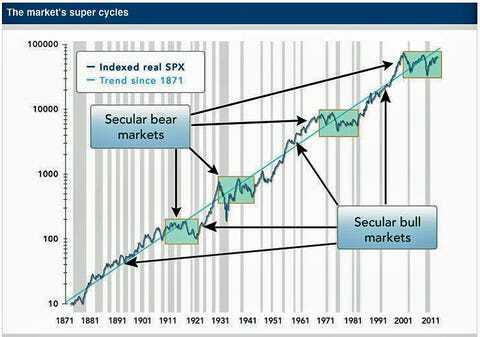 Let's hope we're due another secular bull market! On a separate note, In an attempt at trying to improve my investment performance, and get it more in line with some of the fund managers I follow, I've been doing quite a lot of reading, and as a result I've changed my investment selection process. Now my primary investment criteria is quality, as measured by various metrics including ROE, ROCE, cash conversion etc. Valuation is secondary. This is a significant change as valuation used to be the first thing I screened for and quality was of secondary concern. The rationale behind this change can be summed up with two Buffett quotes. Best Wishes to you all, I hope 2016 is a good year for you, financially and otherwise! It's to late to say happy new year, but yes I can say it's the start of new financial year, so Happy new year from epic research, the place to find best Stock Tips. The energy sector of the S&P 500 fell 1.9 percent. The materials index was also down 1.9 percent.